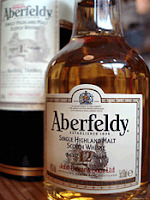 Aberfeldy is a little known distillery in the eastern Highlands. It is owned by John Dewar & Sons. One of the reasons that it is little known is due to the fact that only a small percentage of the 2.5 million litres of whisky produced there every year is released as a single malt under the Aberfeldy name. The majority goes in to the blending of Dewar's white label, which is one of the world's leading selling blended whiskies, with Aberfeldy being marketed as 'the spiritual home of Dewar's whisky'. 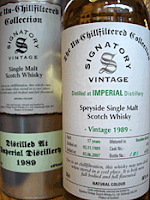 As a result, there are only two current releases of single malt - this 12 years old and a 21 years old. Independent bottlings are relatively hard to find also. The colour is golden with a touch of copper to it and the nose is aromatic and promising. There is clear evidence that the whisky has been matured in a sherry cask, as there is a lot of concentrated dried fruit (think of raisins, sultanas and candied orange peel). On the palate, this is quite light and refreshing, yet complex at the same time. Immediately you get those sherry influenced notes from the nose and these mingle with a malty sweetness and hints of honey, vanilla, something spicy (nutmeg, I think) and some fresh citrus notes (imagine oranges). The finish is long, fresh, fruity and flavoursome with that spicy nutmeg note coming through again right at the end. This whisky was really good and would definately recommend it if you were looking for an 'undiscovered gem'. It is generally only available in independent retailers and should be between £25-30. This is the long awaited new release from the famous Islay distillery. When Ardbeg was bought and started up again in 1997 by Glenmorangie PLC (who were then later themselves taken over by drinks giant Moet Hennessy), the idea was to produce a series of whiskies using only spirit distilled after this date. 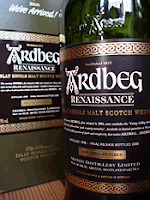 Currently, all other Ardbeg whiskies contain spirit from before it was previously closed. This series has consisted of the 'Very Young' (a 7 years old whisky), the 'Still Young' (8 years old) and the 'Almost There' (9 years old). The 'Renaissance' is a ten years old whisky and is the completion of the series. This whisky smells amazing. It is full of peaty smoke (it reminds me of a damp bonfire) and has lots of grassy, herbal notes and an interesting zesty hint (think of lemon peel). On the palate, this is full bodied, creamy, warming and intense. Your taste buds are caressed by the peat and smoke and underneath this is a great malty sweetness, some vanilla and a hint of toffee or caramel. 'Renaissance' is bottled at cask strength (around 55% ABV) but despite this is very smooth and easy to drink. I decided to add some water, as this tends to release more flavours and characteristics that can be masked by the high alcohol level in cask strength whiskies. This released more grassy smoke and more pleasant bitter earthiness. It revealed a further complexity by opening up some gorgeous sweet summer fruit (reminding me of red or blackcurrants and blackberries) and this was mixed with some menthol (a classic smoky Islay characteristic), some liquorice and a dash of salt (think of sea spray). The finish is long, smoky (think of that bonfire again), a bit dry and also a bit spicy (nutmeg or cinammon, I cannot decide). This is an excellent example of an Islay smoky whisky. It is a full on experience that offers great complexity from beginning to end but is not for the faint hearted. I think it is not quite as sweet as the regular 10 years old bottling and is extremely smooth considering it is bottled at cask strength. 'Renaissance' is readily available but is a limited release so grab a bottle while you can. It should cost around £40-45. 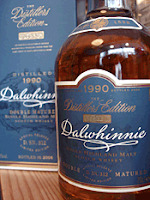 Dalwhinnie is one of the most remote distilleries in Scotland. Located at the furthest most south westerly point of the Speyside region in the middle of the Grampian mountains, it is commonly regarded as a Highland whisky rather than a Speyside. The distillery is owned by Diageo and forms part of their six 'Classic Malts' series and represents the Highlands region. It is Scotland’s highest operating distillery and the village of Dalwhinnie holds the enviable honour of having the coldest average annual temperature of anywhere in the mainland UK (a chilly 6 degrees centigrade!). Despite producing only 1 million litres of whisky per year, Dalwhinnie has climbed in to the top 15 for world single malt sales. There are two core bottlings, a 15 years old and this ‘Distiller’s Edition’ which is 17 years old and finished for the extra two years in an Oloroso sherry cask. Independent bottlings are pretty much non existent. The colour of this is dark and golden with a hint of dusky red. It smells great on the nose with a blast of fruitiness (dried fruit like raisins and sultanas) marrying with rich honey and loads of heather (it is almost like being in the middle of the Highlands). On the palate, this is rich and full bodied, feeling thick in the mouth. There is a lot of sweetness and this comes from the mixture of sherry cask influence (that dried fruit again), some maltiness, something candied (like candied orange peel or marmalade) and a big dollop of honey. The finish is long, warm, rich and very enjoyable. This is a really superb whisky, although it is also one of the sweetest and richest that I have tasted to date so may not be to everyone’s taste. It is definitely more reminiscent of a Highland whisky than of a Speyside, which are normally lighter and fresher. We received this as a wedding present and would be very pleased to receive another bottle sometime. It is a limited release but is reasonably available, although the batches may be different, and retails between £35-40 depending on where you go. Deanston is located to the north of Edinburgh, just above the 'Highland line' (this is an imaginary line that divides the Highland whisky region from the Lowland region). It is a reasonably large and modern distillery, producing 3 million litres per year and opening in 1965. However, the distillery is housed in an old cotton mill and weaving factory and these buildings date back to 1785. 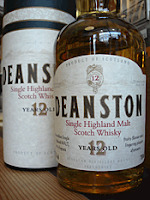 Deanston is owned by Burn Stewart Distillers, who are also own two other distilleries – Bunnahabhain on Islay and Tobermory on the island of Mull. The majority of the whisky produced at Deanston goes into various blends that are produced for export to Europe and Asia. This is the only current official bottling from the distillery and it is little known in the UK, but extremely popular in Europe (especially France). Independent bottlings are available but reasonably limited. This whisky looks pale (think of straw) and the nose smells light and fresh. There is some sweet maltiness (imagine smelling a handful of grain) mixed with fresh grass cuttings and something nutty (it reminded me of the linseed oil that I use on my cricket bat!). There is also a whiff of smokiness. On the palate, it is light and very refreshing, with the malty sweetness and the grassiness from the nose mixing with a more prominent nuttiness (think of walnuts), some citrus notes that give it a bit of zing (imagine lemon zest) and a hint of smoke in the background. The finish is short, crisp and very dry. The citrus and nuts are evident with the herbal grassy note coming in right at the end. This is a pretty good and refreshing and reminded me more of a Lowland whisky (these are normally light, fresh and zesty) than of a Highland. It would be perfect for a hot day or as an introduction for someone who has never tried whisky before. It also sells for a bargain price of around £20 and is well worth a try. Clynelish is located in the town of Brora on the north east Highland coast. It is owned by multi national drinks company Diageo and is their 4th largest operating distillery, producing 3.5 million litres per year. The distillery is quite new and only opened in 1967. However, there has been a distillery in Brora since 1817 and this was also called Clynelish. The current distillery was built next to the old one and they were run simultaneously under the same name until the old one was closed in 1983. Now, any whisky produced at the new distillery is called Clynelish and anything that is still available from the old distillery goes under the name of Brora. The whisky produced at both distilleries has long been well renowned amongst connoisseurs but they are generally unknown to the general consumer. The two main releases are this 14 years old and a limited 'Distiller's Edition' that is part matured in Oloroso sherry casks. Clynelish is readily available through independent bottlers and these offer a great opportunity to buy quality limited release whiskies for a decent price. 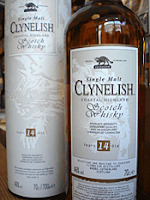 Clynelish is slightly unusual for a Highland whisky as it has some smokiness. However, this is in the background complimenting the other elements and is nowhere near the levels of most Islay malts. The nose is fragrant and has a sweetness that reminded me of honey and heather. There is also a whiff of smoke (think of a bonfire) and sea air. It is incredibly smooth on the palate and is great in your mouth, feeling creamy and velvety. The honey and heather from the nose being joined by some vanilla, a salty tang and some sweet tropical fruit (it reminded me of mango and coconut). The smokiness is there, as is an interesting spicy note (mustard, I think). The finish is long and enjoyable with the sweet elements marrying perfectly with the smoke and saltiness in the background. This is a very interesting and easy drinking whisky that would be ideal to introduce people to a smoky whisky, as the smokiness is not overpowering and mixes excellently with the other characteristics. It retails for around £30 per bottle, mostly from independent retailers. 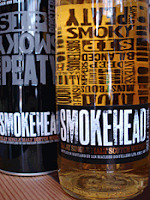 Smokehead is a whisky released by independent bottling company Iain Mcleod's. It is primarily pitched and aimed at attracting a newer, younger consumer. This reflects in the dynamic, graphic and innovative packaging and other promotional material, As well as the price point of around £25-£30. It is rumoured that they use very young (approx. 4-5 years old) Ardbeg from the island of Islay, which is one of the world's smokiest whiskies, but they have not been allowed to use the Ardbeg name. This is very intense from the start. The nose gives a blast of peaty, earthy smoke with an underlying sweetness. On the palate, this is quite complex for something of such a young age (generally younger whiskies can be a bit harsh and rough as the alcohol level is high and other flavours from the maturation process have not have time to develop). This is smooth but your tastebuds are under attack. The smokiness is again very intense but once you get passed this, other characters start to come through. There is something floral (heather, I think), some caramel or toffee, loads of freshly cut grass and an interesting salty tang. There is also a menthol element (think of antiseptic) and a bitter edge right at the end (iodine). These last two are classic characteristics for heavily peated Islay whiskies. The finish is long with lots of smoke and earth again, although the saltiness is also there as is an interesting hint of spiciness (imagine crushed peppercorns). I expected Smokehead to be aggresive as it is so young, but was pleasantly surprised that it was so smooth and rounded. However, the flavours are very intense, it's very smoky and this whisky is not for the faint hearted. Within the marketing they have a number of cocktail recipes that creatively use Smokehead and I would be interested in trying some of these to see how well they work (these can be found on their website www.smokehead.co.uk). A very good buy for the price. 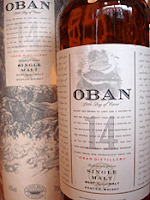 Oban is one of the oldest distilleries in Scotland having opened in 1794. It is also one of the smallest with production of only 650,000 litres per year. This is partly due to the restrictions of it's location. The distillery is situated in the heart of the town of Oban, on the west Highland coast, and is surrounded on all sides by other buildings which makes any expansion impossible. Despite this, Oban is in the world top 20 for single malt sales and is especially popular in America. This is due, in no small part, to owners Diageo selecting Oban to be the representative of the west Highlands region in it's 'Classic Malts' series. The small production volume dictates that the only bottlings are the 14 years old and a limited release 'Distiller's Edition' which is partly matured in Amontillado sherry casks. Independent bottlings are virtually impossible to find. It is pale and golden in colour with a pleasant, light nose. There is a subtle blend of vanilla, honey, some dried fruit (imagine candied orange and lemon peel) and malted barley. The palate is again light and very smooth with all those elements from the nose present and mixing with some caramel, a small salty tang and maybe a hint of peat smoke. The caramel, vanilla and saltiness especially come through on the finish, which is light, short and pretty dry. This is a light and enjoyable whisky that is not particularly complex or challenging, but good and very easy drinking. I can see why this is popular and it would be very good as an aperitif, on a hot day or to have with seafood, as the slight saltiness would compliment that well. Retail price is around £35-£40 per bottle. The Imperial distillery has been closed since 1998. It is located in Speyside and is currently mothballed (this term means that the distillery remains intact but is not in operation). The distillery originally opened in 1897 and has had a chequered history resulting in it being closed on four seperate occasions, totalling over 50 years of non production. Fortunately, it has been re-opened on three of these occasions by new owners and it remains to be seen if the current owners, drinks giant Pernod Ricard, will do the same. The stocks are dwindling and releases are few and far between, limited to independent bottlers. However, Imperial is held in high regard within the whisky world so I was keen to try for myself. This release from independent bottler Signatory Vintage is a 17 years old. The colour is very pale for something of that age and the nose is promising. The aromas are complex with an initial malty barley sweetness giving way to fresh fruit (think of the smell of a shiny red apple) and something herbal (reminded me of freshly cut grass). This whisky is light and fresh on the palate with the malty sweetness mixing with a fruity element (but dried fruit this time, like sultanas and dried apple), vanilla and just a hint of spiciness (ginger, I think). The finish is medium to long and really grassy. There is also a bitter edge to it which some may find a bit harsh. However, I found it to be very refreshing. This is a subtle and delicate whisky that would be very easy drinking in hot weather or as an aperitif. It is also great value at just under £30 a bottle, especially when considering that the distillery is closed, and available at independent retailers only. Mackmyra is the first Swedish whisky distillery. Located 170km north of Stockholm, it opened on a small scale in 1999 and was upgraded in 2002 and full production started. Their first official release is released in Sweden today and will arrive in the UK later this year. Before this they have released a series of limited edition preludes, starting with the Preludium 01 in 2006. Within this series, they have experimented by using different casks and methods in order to produce highly innovative and interesting whiskies using local ingredients. The distillery's reputation is growing fast and each Preludium has sold more and more. 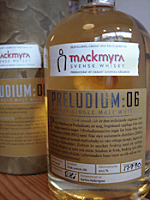 This Preludium 06 was released as the last in the series late last year and sold out in less than a day in Sweden. It is still very young for a whisky at four years old and the colour is very light (quite grassy, like hay). The nose is fruity (fresh apples and pears) and quite zingy and citrusy (lemon and lime zest). There is some sweetness (reminiscent of honey and caramel) and an interesting smokiness. It is more like burnt, fragrant wood smoke rather than the peaty smoke of Scottish whiskies. This is due to Mackmyra using a mixture of peat and juniper twigs to dry their malted barley, with the smoke from the juniper twigs infusing into the malt. On the palate, this is fairly sweet and smoky but still quite fresh. The fruity citrus notes from the nose are present, as are the vanilla and caramel. There is also a hint of saltiness which adds a interesting twist. However, it is that fragrant smokiness from the juniper twigs that leaves the lasting impression as it is so different from smoky whiskies that I have tasted before. The finish is pretty long and smooth (generally young whiskies can be a bit rough with the alcohol and flavours softening over more time) with vanilla, sweet smoke and again a touch of saltiness. The Preludium 06 is only available in a couple of retailers in the UK, of which Royal Mile Whiskies is one. It retails for around £45 and is really good. It would be a good whisky to give someone if they are not sure about smoky flavours as this is a different type of smokiness, with the juniper giving a herbal flavour reminiscent of gin. I cannot wait for the first official release later this year as this and the other Preludiums I have tasted show incredible promise. The Old Pulteney distillery is the most northerly mainland distillery found in Scotland. Located near to the town of Wick and not far from John O'Groats, it is also one of the most environmentally friendly distilleries with the excess thermal energy produced there being used to heat over 1000 local homes. It is owned by Inver House and produces around 1 million litres of whisky a year. 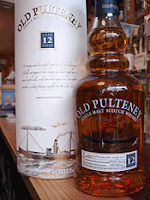 Old Pulteney's core range is small and consists of this 12 years old, a 17 years old and a 21 years old. Independent bottlings are few and far between but generally of high quality (see in the whisky cupboard ...). The brand has grown massively in the last three years and this has seen Old Pulteney climb into the top 20 for world sales of single malt. This 12 years old is consistently one of the top sellers at Royal Mile Whiskies. The colour is orangey gold and the nose is very promising with vanilla, some fruitiness (think of a crisp green apple) and a whiff of saltiness (think of sea air). The palate is rich, creamy and full bodied. It has a mixture of elements that marry together surprisingly well. The vanilla and fruit from the nose are there but are joined by some sweetness (imagine honey), nuts (think of almonds, but almond essence I think as it's slightly fake) and a hint of something bitter (like dark chocolate or coffee beans). The saltiness is also there and adds a fresh tang to the whisky (this flavour is present in whiskies that are matured near to the sea, as the wooden casks are porous and breathe in the sea air over time). This is a very good whisky and it is easy to see why it is so popular in the shop, as it combines excellent quality with a decent price (normally around £25, making it one of the best whiskies that you can buy for around that price mark, in my opinion).